Just when choice arrives, RV Outfitters is the place to look! MotoSAT has Jim Sizemore and Greg Fulton at RV Outfitters supplied with their latest DataStorm G series in satellite dishes. For travelers this makes the choice yours for television viewing. MotoSAT’s slogan, “What the competition THINKS is next generation, is already here” isn’t bragging, and their new HDTV dish satellite equipment will bring excitement to everyone’s spring, clean-up time. This little baby will stow down to 10.5 by 53 inches for travel and sets up just as slick! Did you want DirecTV, Dish, or Star Choice? Or, choose one for Hughes Internet Satellite service just as easily. Your choice is no problem for a MotoSAT dish receiver. She’s sitting pretty! 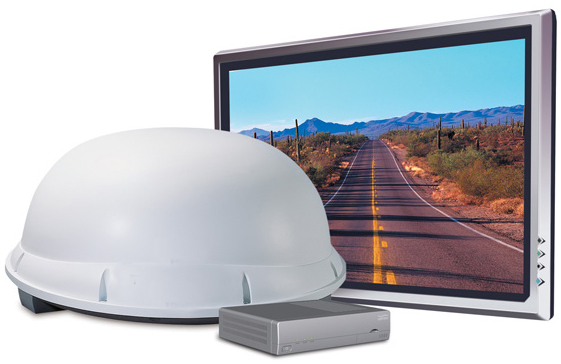 And, RV Outfitters is here to install the components and wiring for connections; everyone in the family will be ready to sit down and watch HDTV from anywhere that you travel. Most of us have seen commercials running on television recently offering internet connections for remote and rural areas that don’t have cable options or dish competitors vying for viewer’s business. RV Outfitters knows this same need can affect travel trailer, coach, and motor home travelers, too. RV Outfitters in Bend, Oregon, is the experienced dealer who specializes in providing the necessary equipment and installations that meet these and viewing needs for people on the go. Customer satisfaction drives the high level of service offered at RV Outfitters. Recently, Alan and Debra had a new HD-SL5 satellite dish installed to connect a DVR recorder and flat screen television with DirecTV to receive all five of their satellites. 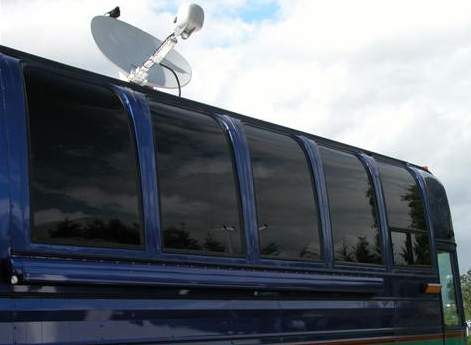 With a two year old Beaver Coach, they had purchased with it a system for in-motion satellite viewing. Alan said that though they were warned that precipitation and moisture could disturb viewing quality, they never thought it would interfere enough to become a problem. After two years of fighting a system where weather related problems stopped reception in its tracks, where if the dome receiver encountered fog or a light sprinkle, snow, any mist or condensation, loss of pixels would distort or lose the picture, they were ready for dependable reception! Over and over, with customers telling how RV Outfitters are honest dealers, how their prices are honest, and they deliver at the price they quote, it makes getting that new satellite system an easier choice. And, about that spring cleaning, customers also tell how their coach, travel trailer, or motor home comes back “spiffy,” with no clean-up needed after RV Outfitters does a job! Way to go, guys!